Children and Worship: We warmly welcome children to the worship service by providing a Worship Bag and children’s activity bulletin every Sunday. Pastor Boling gives a special Children’s Message every week that is related to the overall theme of the service. We do not staff a church nursery, but we fully understand that parents may need to step out with a restless infant or toddler as needed and return when ready. 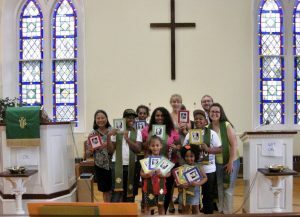 Children and youth assist the pastor as worship leaders from time to time. The Youth Choir sings approximately six times a year. Vacation Bible Camp: New in 2018, we offered a week of hands-on fun and learning for kids age 4-yrs through 8th grade. 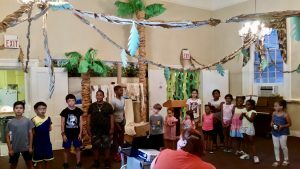 Dinner, music, crafts, Bible Discovery lessons, games, skits and our KidVid cinema made for a lively program while we were all “Shipwrecked” together for the week learning how Jesus rescues us from the storms of life. Campers filled a treasure chest with daily food offerings for our Food Pantry—peanut butter, jelly, spaghetti sauce, canned tuna and canned fruit. Spectacular decorations transformed the Parish House into a tropical island complete with vines, palm trees and a waterfall. 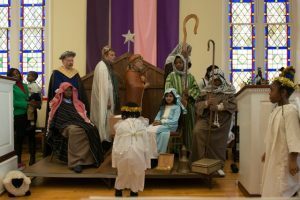 Children’s Christmas Pageant: Each year on the second Sunday of Advent, an original Christmas Pageant written by Pastor Ruth takes the place of the sermon. 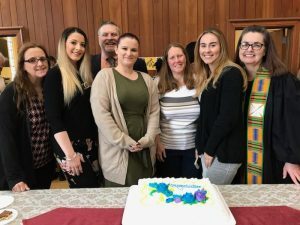 There is always a part for every child and teenager in the church, and even some of the adults! 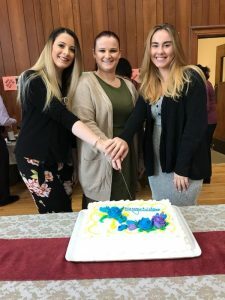 Scholarship Sunday: On October 21, 2018 we were pleased to award four (4) college scholarships to our students who are furthering their education in college or graduate school.